I was so excited to be back with Lily and Rowan and especially after that crazy ending of Trial by Fire. Just reading any conversation between them put a smile on my face. 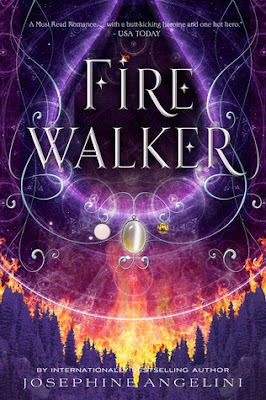 Although I felt like Firewalker had a bit of a slow start (I can be impatient so it might’ve been me), I still was sucked into the world and again I am now starving for book three. Lily and Rowan are still themselves and I still love them. Especially Rowan. Together and separate they are forces to reckon with. I love how tender and protective Rowan can be of Lily but still gives her space to do what she needs to do. I only sort of remember Una and Breakfast from the first book. Even though I read it twice. I think my focus was just not really on them. (That whole impatient thing) so having them become a big part of Firewalker gave the story some fresh perspectives. Although I didn’t feel like we got to delve too much into their actual personalities, I can see them having an even larger role in the next book. So we finally get the insight we need into why Lillian has done the things she has. It made change your perspective of her. Of course understanding where someone is coming from, doesn’t always mean you agree with the way they go about fixing things. It was interesting to get to see Lillian’s memories and I’m glad it focused on her time spirit walking and dealing with the Shaman. If there had been too much her and Rowan it would have been weird. The woven! I’m absolutely fascinated by them and what they actually are. It freaks me out when they are described but I have the same questions as Lily. I want them fully explained and I like that she is now on a quest to figure it out herself. We’ve got some heartbreak my friends but I didn’t feel as sad I normally would because I’ve got some hope too. I really liked Firewalker and it is still high on my list. I didn’t love it obsessively like I did Trial by Fire but I definitely am excited for the next book. I can’t wait to see how Lily and Rowan’s stories pan out.